Former Republican presidential candidate Ben Carson says he and Donald Trump have "buried the hatchet" after months of political wrangling, and he is endorsing the GOP front-runner's White House bid. 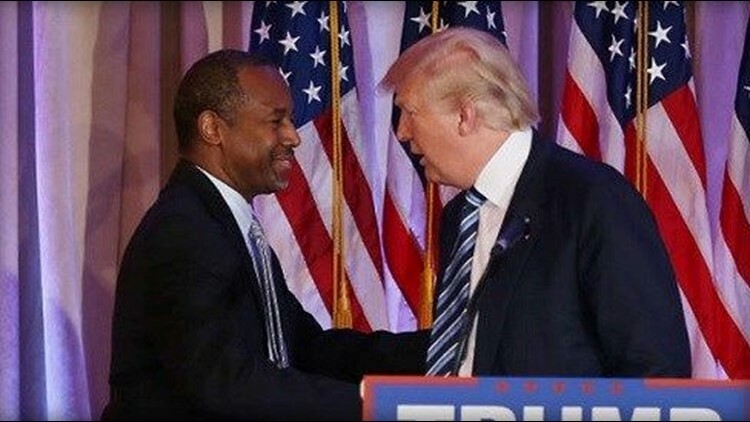 PALM BEACH, Florida (AP) — Former Republican presidential candidate Ben Carson says he and Donald Trump have "buried the hatchet" after months of political wrangling, and he is endorsing the GOP front-runner's White House bid. At a press conference in Palm Beach, Florida on Friday, Carson, who left the race earlier this month, described "two Donald Trumps" — the persona reflected on stage, and a private, "very cerebral" person who "considers things carefully." In his introduction to Carson Friday, Trump described the retired neurosurgeon as a "special, special person — special man," and a "friend" who is respected by everyone. Carson warned that it is "extremely dangerous" when political parties attempt to "thwart the will of the people," and urged politicians to "strengthen the nation," rather than create divisions.